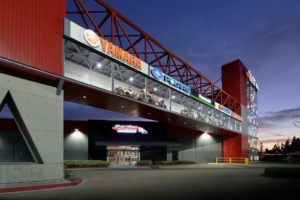 Traveling north on the Costa Mesa Freeway (Route 55) in Southern California, you can’t miss Del Amo Motorsports’ impressive monolith of motorcycles. Built into the front apex of the building, which appears more modern art museum than motorcycle dealership, Del Amo’s attention-grabbing glass tower vertically showcases five stories of motorcycles. Day or night, it’s a bold beacon that draws the eye – whether or not one rides a motorcycle. Santa Ana is the newest store in the Del Amo Motorsports brand, and was built in 2014. They sell Kawasaki, Suzuki, Yamaha, Polaris and Honda. Partners Scott King and Pablo Veglia started the business 30 years ago and run two other Del Amo dealerships in Long Beach and Redondo Beach. 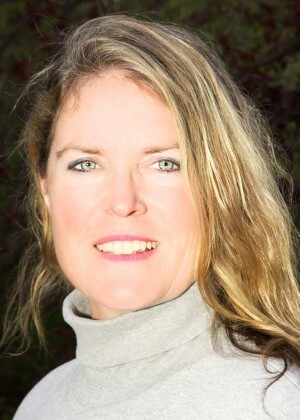 Claudia Perez is the director of operations for all three stores and started working for Del Amo in 2009. 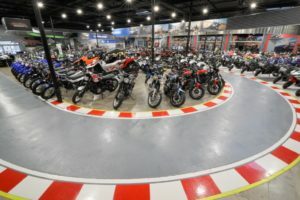 Del Amo’s events include a spring open house with stunt rider Jason Britton, a parking lot sale at the Santa Ana location and a Catalina Island Ride every August. The Catalina ride is on jet skis, and they limit it to about 30 skis. The excursion takes them all the way to Catalina, where they have lunch, then return in the afternoon. It’s a highlight for their water-loving customers every year. Demo rides are a big part of Del Amo’s marketing strategy, and offering incentives for trade-ups is an important part of their business model. Not only do they offer motorcycle demo rides, but also they offer water sports demo events at the marina in Long Beach when it’s watercraft season. 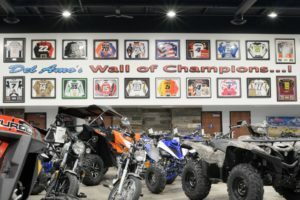 Dirt bike demos are more difficult in the LA area, so they connect with the OEM schedules and promote off-road riding demos when the OEM demo trucks are in the area. Perez commented that they haven’t experienced the dreaded dip in sales that so many in the industry have felt. “I think one of the things that we do – just ask the team – we work at our stores more as businesses instead of small shops or just a mom-and-pop shop. We look at it as a business. We strategize like a business. We try to stay as professional as we can. We embrace technology, trying to stay forward thinking, budgeting and forecasting and looking at trends so that we can plan our success,” said Perez. The Del Amo dealerships do experience sales turnover, and at the beginning of the year the organization invested in a new CRM solution that is more interactive with texting, emailing and picture uploads, making it easier for the sales staff to be able to communicate with their customers. They find many of the customers now want their communications via text or email. Supervisory-level employee retention is very high, so now they are actively working on retention on the sales floor. “We are so good at retaining our general managers and management-level employees that they’ve been with us for a long, long time. We are all trying to figure out how to create a better environment for the rest where they want to be here and succeed and see the long-time vision where they could become the manager eventually, if that is their aspiration,” said Perez. Southern California is a very competitive motorcycle market, yet Del Amo Motorsports is growing and thriving thanks to strategic planning, effective marketing, terrific customer service and in-store events. They’re engaging – and profiting from – the 18- to 35-year-old male audience, always trying new strategies and finding what could be of value to them so that they keep coming back to their stores.